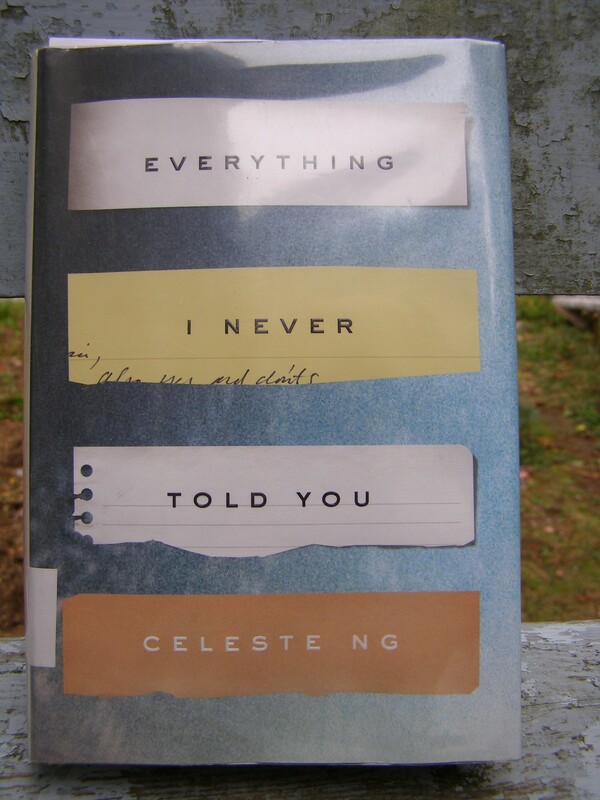 Everything I Never Told You is as good as everyone says it is. This is how the story begins. The first line grabbed me right away, and my attention was held the whole way through. It doesn’t seem right to do anything but wait. The children stay home from school. Television, magazines, radio: everything feels frivolous in the face of their fear. Outside it’s sunny, the air crisp and cool, but no one suggests that they move to the porch or the yard. Even housekeeping seems wrong: some clue might be sucked into the vacuum, some hint obliterated by lifting the dropped book and placing it, upright, on the shelf. So the family waits. They cluster at the table, afraid to meet each other’s eyes, staring at the wood grain of the tabletop as if it’s a giant fingerprint, or a map locating what they seek. Lydia is the beloved middle child of James and Marilyn. Ever since her mother ‘went away’ for a few months one summer when she was five, Lydia has promised to do everything she can to make sure her mother never wants to leave again. That is a big job for a young child. From all her studying, this flashed through her mind: For every action, there is an equal and opposite reaction. One went up and they other went down. One gained, the other lost. One escaped, the other was trapped, forever. Marilyn grew up with the dream that she would one day become a doctor in a day and age when most doctors were men. Part way there, she met James, fell in love, became pregnant, and they married. Now, she hopes that someday Lydia will become a doctor instead. She pushes Lydia to take sciences and do well in school. Lydia agrees to everything. You loved so hard and hoped so much and then you ended up with nothing. James feels haunted by his own loneliness growing up in the community’s only Chinese American family. He desperately wants his children’s experience to be different. He despises in them what he sees in himself. He imagines Lydia’s life to be different than what it is, and encourages her to fit in and be like everyone else. White and not white. … this thing makes all the difference in the world. Nath is Lydia’s older brother. Ever since the summer their mother disappeared for a few months he has felt invisible to his parents. He sees what it’s like for his sister to take on so much pressure from their parents, and he has been protective of her over the years. But, really all he wants is to leave. It was too big to talk about, what had happened. It was like a landscape they could not see all at once; it was like the sky at night, which turned and turned so they couldn’t find its edges. It would always feel too big. He pushed her in. And then he pulled her out. All her life, Lydia would remember one thing. All his life, Nath would remember another. Hannah was born after the eventful summer of Marilyn’s disappearance, but she has grown up under it’s shadow. She has been overlooked her whole life, and doesn’t expect anything different. She makes herself scarce and watches her family closely. She seems to know more about what goes on then anyone else in the family. What Ng does so well is make this family seem so ordinary, like they could have been my family or yours. On the surface, they seem normal and happy. Marilyn and James have had the best intentions for their family, like we all do. But, as we dig deeper into the story, we find out about all their insecurities and how they hide them from each other. Marilyn and James have no idea that Lydia feels so much pressure. They mean well, and think their daughter is happy and willing to please them. It is amazing to see how a lack of communication and connection with their children, very ordinary things that can easily happen to any of us, causes the family to grow so far apart from one another. Far enough apart that, when tragedy strikes, they completely unravel, becoming even more disconnected, rather than using each other for support and comfort. It is painful to watch this happen, and to see them dealing with it in their own, often destructive, ways. This is a story about how our pasts can stay with us, shaping not only ourselves, but also the lives of our children. As the story unfolds, it moves smoothly and naturally from one perspective to another, as well as between the past and present, filling in the gaps until we know the whole truth. There is a lot going on in this novel. Ng makes every word count. Will James and Marilyn ever find out what really happened to their daughter? And, will their family ever be able to begin to heal? Just when I was starting to think that things had gone too far, that they would never be able to come to terms with their grief and the disconnect that has formed over the years, Ng offers us a glimmer of hope. You can read this thorough and insightful interview with Celeste Ng at Rosemary and Reading Glasses. For more interviews and reviews of her book, find them at Celeste Ng’s website. Also, check out this Bookish Drink, inspired by Everything I Never Told You! Read a few more good blogger reviews of Everything I Never Told You at: Rosemary and Reading Glasses, River City Reading, and The Gilmore Guide To Books. It amazes me and makes my head spin how fast you go through books. I’m lucky if I can get through a short story that fast. What’s your reading schedule? Fast reader and writer too! Love her reviews. Always. The only downside to reading Naomi’s blog: my too-read list has become so much longer since reading her great posts. So many books, so little time. It’s funny you should say that, because I often think I read a lot less books than other book bloggers I follow. If I’m doing well, I read about 2 books a week, but it usually works out more like 3 books every 2 weeks. I wish I could read more! I mostly just read at night for a couple of hours after the kids go to bed. If I’m lucky, I get a bit of extra reading done on the weekend if the kids are occupied. But, that’s it. I think the key is consistency. No matter the state of the house at night, I read my book. Thanks for reminding me why this book is on my TBR pile. I love a good family drama. This sounds great! It is good, and I think you’ll like it! I also found it pretty quick, partly because I didn’t want to put it down. 🙂 I definitely recommend it. This sounds like a great read. Thank you for the review! I love portraits of family life. Especially dramatic ones! I’m keeping an eye out for this one. I really think you would like it! I loved how we got to see ‘hear’ from each member of the family. I so, so loved this book and I’m thrilled to see it being enjoyed by others. You did a perfect job explaining all of the story’s little nuances – great review. Thanks for the compliment, Shannon! I think it’s the kind of book that would appeal to most people, and I hope it will be well read! I love good opening lines! Does the book follow the perspective of all of the characters you listed? What attracts me to the story is the relationship between the parents and their children. Yes, we get the perspective of each family member. All the relationships were so interesting to read about, even the ones between the siblings. It also goes back to the relationships between the parents and grandparents, so you can get a good idea where the insecurities are coming from. This sounds like a really insightful story about the inner workings of family life–the love, but also the unseen strings that sometimes go with it. Thank you for sharing these books with us. You are truly a wonder! I don’t know how you can consistently find and read and share so much material of such high caliber, but I have learned to trust your judgement when it comes to stories. Thank you once again for your kind words, Naomi! It makes me happy that you and others can enjoy the books I’ve talked about and shared. This is truly a good one! Enjoy it! Beautiful and profound story. Will be reviewing it soon. I loved this book! Looking forward to her next one!